There were over 258,616 American Indians over the age of 65 in 2016. The population of elder Natives is expected to grow by 116 percent by 2030. They’re estimated to increase to 309,000 by next year, 443,000 in 2030, and more than 648,000 by 2060. 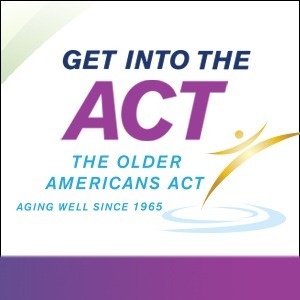 In 2018, there were 296 tribes receiving Older Americans Act (OAA) Title VI funds. OAA language indicates that Title VI programs be comparable to those under Title III, but unfortunately this is not the case. The National Indian Council on Aging (NICOA) recommends increasing funds for caregiver programs, fully funding Title VII-B, increasing the funding for Title VI, moving Title V “set aside” funds to Title VI, implementing and establishing a White House Conference on Indian Aging; and elevating the director of the Office for American Indians, Alaska Natives and Native Hawaiians Programs to assistant secretary of American Indian and Alaska Native Elders. The increased funding for Title VI should ensure that tribes receiving Title VI funds maintain funding levels that will ensure services are delivered and at 1.5 times the inflation rate, as costs are higher on tribal lands. The “set asides” of Title V (SCSEP) are an acknowledgment of the unique government-to-government relationship enjoyed by tribes. Moving Title V “set aside” funds to Title VI would consolidate programs for Native elders in one office rather than fragmented among several federal agencies. Title VII-B has never been funded and with the increasing incidence of elder abuse, fraud and neglect in Native communities, this is a need that must be addressed. Many tribes don’t have their own specialized elder protective service so there may not be anyone to report abuse to, or insufficient resources for a response even if a report was made. For over 40 years, tribal elders and officials have been recommending the implementation and establishment of a White House Conference on Indian Aging. The meeting would recognize the federal trust responsibility and be equal to a national consultation between Native elders and the U.S. government. Some studies indicate that one in five elders will suffer from Alzheimer’s disease or dementia. Last year, over 6 million people were diagnosed with Alzheimer’s or dementia, requiring 18 billion hours of caregiver support. Assuming national rates are the same in Indian Country, if one in five Native elders suffer from Alzheimer’s or dementia, that number today would be 61,800. The elevation of the director of the Office for American Indians, Alaska Natives and Native Hawaiians Programs to assistant secretary of American Indian and Alaska Native Elders is another recommendation submitted over the last 40 years to no avail. The elevation of this office to assistant secretary, with jurisdictional authority, is a recognition of the importance of the unique government-to-government relationship between Native tribes and the U.S. government. 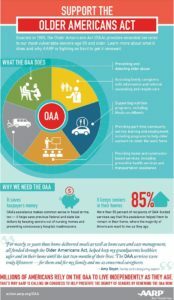 The OAA is the key legislative framework for developing, coordinating, and delivering home and community-based services that allow American Indian/Alaska Native (AI/AN) elders to maintain their independence. The Title VI program of the OAA provides support and nutrition services which aid AI/ANs across the country. The OAA provides a long-term care ombudsman program to protect the rights and wellbeing of those living in long-term care facilities. It also authorizes the only federal workforce program that provides training to help low-income elders transition to employment in their community. Sadly, the OAA is consistently subject to sequestration, resulting in unnecessary and harmful cuts each year.